Henrich Focke was born in Bremen on Oct. 8, 1890. He studied at University of Hanover, where he became friends with Georg Wulf in 1911. In 1914, he and Wulf both reported for military service and Focke was deferred due to heart problems but was eventually drafted into an infantry regiment. After serving on the Eastern front, he was transferred to the Imperial German Army Air Service. Focke graduated in 1920 as Dipl-Ing (roughly equivalent to a master’s degree) with distinction. His first job was with the Francke Company of Bremen as a designer of water-gas systems. At the same time, he continued his aeronautical experimentation, he and Wulf building the new A VII around the engine from the A VI. In 1923, with Wulf and Dr. Werner Naumann, Focke co-founded Focke-Wulf Flugzeugbau GmbH. In 1927 Wulf died while test flying the Focke-Wulf F 19 “Ente” canard monoplane. Focke-Wulf constructed Juan de la Cierva's C.19 and C.30 Autogiros under license from 1933, and Focke was inspired by it to design the world's first practical helicopter, the Focke-Wulf Fw 61, which first flew on June 26, 1936. In 1936, Focke was ousted from the Focke-Wulf company, ostensibly because he was considered "politically unreliable" by the Nazi regime. 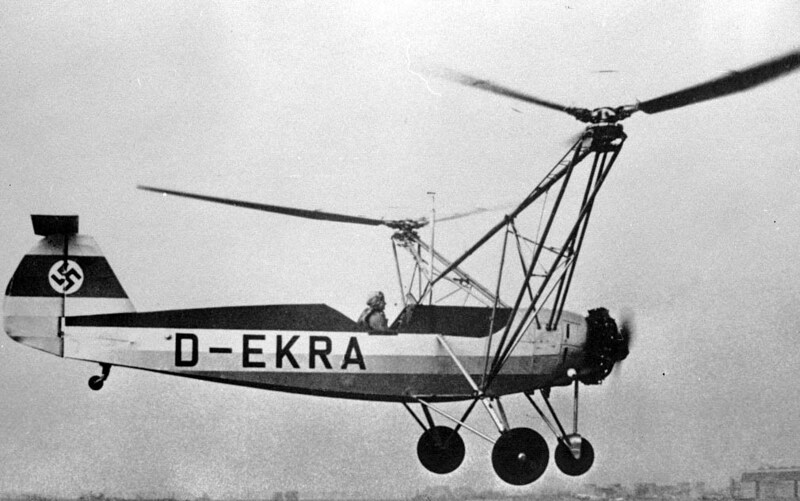 The company was taken over by AEG, but soon after this the Air Ministry, which had been impressed by the Fw 61 helicopter, suggested that Focke establish a new company dedicated to helicopter development and issued him with a requirement for an improved design capable of carrying a 1,500 lb (700 kg) payload. Focke established the Focke-Achgelis company on 27 April 1937 in partnership with pilot Gerd Achgelis, and began development work at Delmenhorst in 1938. The new company built the experimental Fa 225 using the fuselage of a DFS 230 glider and a rotor from a Fa 223. Another project was the Fa 330 kite with rotor, capable of being deployed by a submarine on short notice and then used as a towed spotter. It was stored in a watertight container on the deck of the U-boat and was used during the war. Focke subsequently manufactured the heavy-lift transport helicopter Fa 223, and designed the Fa 224, Fa 266, Fa 269, Fa 283, Fa 284, and the Fa 336 during World War II. Only a few of the large Fa 223 Drache ("Dragon") helicopters actually were produced, but even the prototype set a new helicopter speed record of 113 mph (182 km/h) and climb record of 1,732 ft/min (8.8 m/s) in 1940. Subsequent war models were primarily used as mountain troop transport, rescue, and crashed aircraft recovery. The helicopter had provision for a nose-mounted machine gun, and could carry one or two bombs, but the Drache was never used for combat. On Sept. 1, 1945, Focke signed a contract with the French company SNCASE and assisted in development of their SE-3000 passenger helicopter, which was based on the Focke-Achgelis Fa 223 "Drache" and which first flew in 1948. In 1952, Focke and other members of his former design team were employed by Brazil's Centro Técnico Aeroespacial (CTA), at the time the air force's technical center, to develop the "Convertiplano" (convertiplane), which drew heavily on Focke's wartime work on the Fa 269. Also recruited was Bussmann, a transmission specialist formerly of BMW. While working at the CTA, Focke also developed the BF-1 Beija-Flor (hummingbird) two-seat light helicopter from 1954, which made its first flight at Sao Jose dos Campos on Jan. 22, 1959. 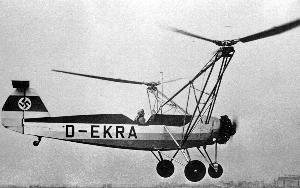 The BF-1 was similar in design to the Cessna CH-1, with a 225 hp Continental E225 engine in the nose and the rotor mast running vertically between the front seats. An open structure tubular steel tail boom carried a pair of tail surfaces and a small tail rotor. The BF-2 was developed from this and first flew on Jan. 1, 1959 and performed an extended flight-testing campaign until it was damaged in an accident. Focke returned permanently to Germany in 1956 and began developing a three-seater helicopter named the "Kolibri" (hummingbird) at the Borgward company in Bremen, with its first flight taking place in 1958. While working at Borgward, Focke set up a wind tunnel on a property in central Bremen (this wind tunnel was rediscovered in 1997 and is today the centerpiece of a museum devoted to him). After Borgward collapsed in 1961, Focke became a consulting engineer with Vereinigte Flugtechnische Werke of Bremen and Deutsche Forschungsanstalt für Luft-und Raumfahrt. Focke was awarded the Ludwig-Prandtl-Ring from the Deutsche Gesellschaft für Luft- und Raumfahrt (German Society for Aeronautics and Astronautics) for "outstanding contribution in the field of aerospace engineering" in 1961. Focke died in Bremen on Feb. 25, 1979.